Kieran Molloy, pictured, is planning to put in another big performance in the last four of the Irish Elite Championships at Dublin’s National Stadium. The Galway welterweight beat Mayo’s Aaron Daly on a unanimous decision last weekend to move to within two wins of defending his 69kg title versus Dublin’s Luke Maguire on Saturday. Limerick’s 2015 World Junior finalist Paddy Donovan and Antrim’s 2018 Commonwealth Games finalist Aidan Walsh go head-to-head in the corresponding 69kg semi-final. Defending middle and light welter champions Michael Nevin and Wayne Kelly, both of the Portlaoise BC, crashed out of the tournament to Gabriel Dossen and James McGivern last Saturday. Molloy, who won his first Elite belt and the Best Male Boxer Award in 2018, is determined not to become a notch on the belt of a young prospect out to make a name for himself at the home of Irish boxing. “A good start,” said Molloy after his win over Daly. “I felt very comfortable in there and I’m looking forward to the semis where I will put in another big performance. “I’m feeling confident heading into these Championships. I’ve had a lot of international fights in the past year and gained a lot more experience. Meanwhile, the flagship tournament of Irish boxing resumes on Friday evening. Limerick’s Myles Casey, a former Elite champion, and his nephew Tommy Casey can guarantee the St Francis BC a title if they win. 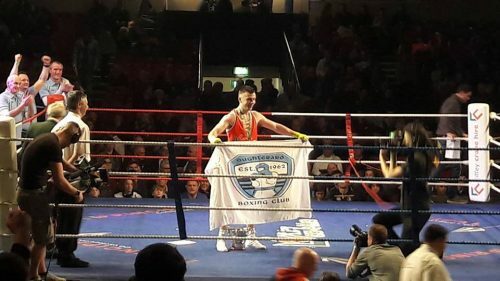 The Treaty City featherweights – who both box out of the St Francis club – meet Christian Cekiso of the Portlaoise BC and Patryk Adamus of the Drimnagh BC in the last four. Cork welter Christina Desmond, a World Youth finalist and European Elite bronze medallist, is in against Tina Donnelly, while defending champion Grainne Walsh, who received the inaugural Jimmy Magee Best Female Boxer at the 2018 Elites, and Gillian Duffy face off in the corresponding semi-final. Dundalk’s European U/22 champion and World Elite quarter-finalist Amy Broadhurst and Shauna O’Callaghan clash Friday. Moira McElligott awaits in the light-welter final. Rio Olympians Joe Ward and Brendan Irvine and EU champion Kurt Walker are out of the Championships with hand injuries.